Probably many of us have seen at least demos of using Photoshop to un-clutter your photos, resulting in almost unseemingly removed objects and restored background. While I won’t argue that Photoshop does excellent job at this, it is good to know that open-source GIMP this functionality too. 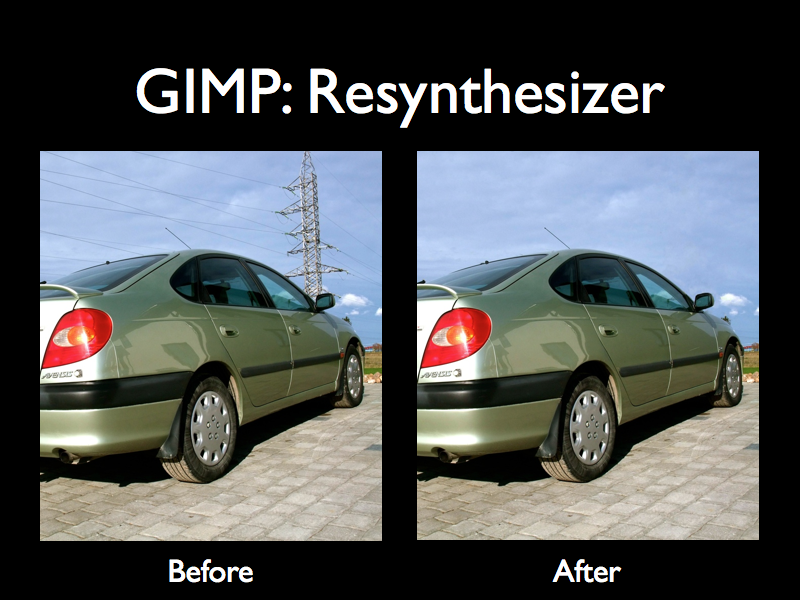 The GIMP Resynthesizer plugin makes it easy to intelligently remove unwanted objects from photos. There seems to be a 2.0 version of this plugin available at the developer’s github page (bootchk/resynthesizer), but I haven’t tried that yet. How this plugin works has been covered number of times before, (e.g this “Content-Aware Fill” clip or this resynthesizer tutorial), so I won’t go into details of this here. Only difference for me was that I used the Enchance > Smart remove selection... filter rather than Map > Resynthesize... and the result is displayed below.